The logo and guitar is fantastic! Nice addition to the towel. The guitar is great and I love the quote from Secret Life of Bees! That was a great book. OH! I missed the bee! The font is fantastic! So delicate looking. The bee is super real looking too! I, too, love the bee! Really delicate stitches and the font is perfect. Mamaphunk - That treasure chest is fantabulous! I love the look of all the gold dubloons. rectangel - Love the burlesque girl! The colors are perfect and her hair looks great. I am astounded at how you make embroidered faces all look so unique. ThirdMargaret - lovely script and love the bee. millik - that looks great. Too much awesomeness to catch up on! sarahj2001 ~ I love the cute utensils you stitched on my apron! they're so happy and sparkly! millik ~ cool logo! I love the X with the crown on top! rectangel ~ beautiful no peeking girl! love the feather stitched fan and the beads too! GatsbyGirl ~ loooove your katamari prince on millik's towel!! so so awesome!! ThirdMargaret ~ you have such pretty stitchy handwriting! Mamaphunk ~ great treasure chest of jewels! fiberartsy ~ beautifully stitched dogwood flower! ~Glenda ~ lovely addition to rectangel's towel! love the girl's outfit and the travel theme! I Sew Cute ~ cool mermaid and french knotted sand! 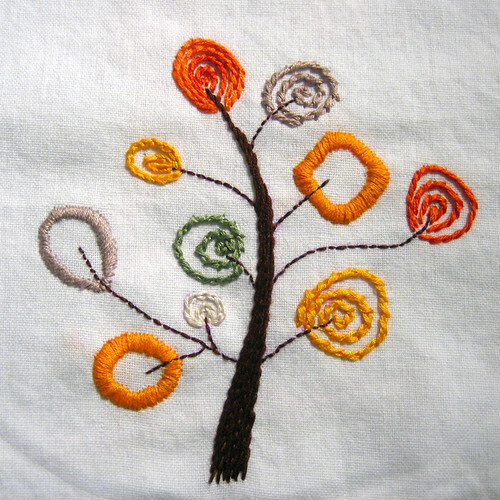 This tree pattern is from Woolly Embroidery book but I used normal DMC floss, not wool floss cuz I don't have any! Crossed chain stitch is now my favorite stitch! That tree is fantastic! I've been in such a fall mood lately. Perfect! ritapizza - I love that tree. I have seen the book on Amazon and wanted to get it just for that pattern! Love the tree! I have that book, but haven't stitched anything out of it yet . . . great inspiration!